Aberdeen Roads Limited was awarded the contract to build the AWPR/B-T in December 2014. Who then appointed AWPR Construction Joint Venture as the principal contractor. The JV includes Balfour Beatty, Morrison Construction and Carillion. The £745m Aberdeen Western Peripheral Route / Balmedie to Tipperty (AWPR/B-T) is one of the largest infrastructure projects in Scotland. 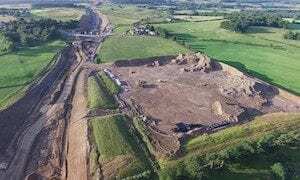 The project is part of Transport Scotland’s commitment to improving travel in the north east of the country.The new road will be 58km long and is expected to open in winter 2017/18. It will consist of four sections: Balmedie to Tipperty: 12km from Blackdog to Tipperty. Northern Leg: 16.1km from North Kingswells to Blackdog. Southern Leg: 18.7km from Charleston to North Kingswells and Fastlink: 11.5km from Stonehaven to Cleanhill. Venesky Brown are a trusted partner of Balfour Beatty and Morrison Construction working closely with them on various infrastructure projects throughout the UK. After completing the Lagan-Tormore Project with Morrison supplying 200 operatives at peak, we were approached to supply cvil engineering operatives at the AWPR project. Supplying operatives mainly for the structures along the route.